At the core of one person one vote is the principle of electoral equality, not that of equality of representation… making sure that each voter gets one vote—not two, five or ten…or one-half. The greatest foreign influence in our elections are aliens who are getting on the rolls and aliens who are voting. Look no further than this shack and the corresponding voter roll data to question the legitimacy of our nationwide voter rolls. 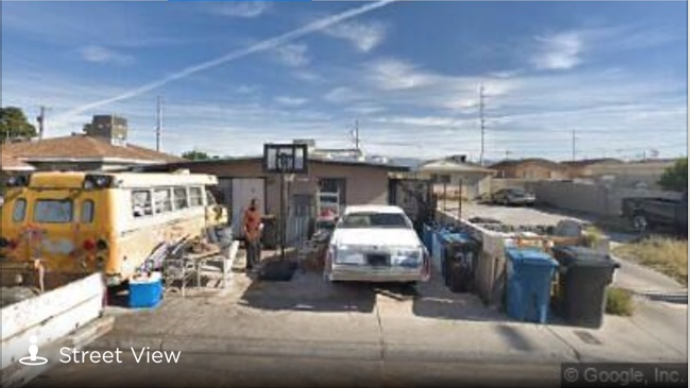 15 registered Democrats reportedly live in this 2 bedroom, 1 bathroom shack in Clark County, Nevada. Yet, there are many more homes in Clark County with multiple registrants and duplicate registrants that are in question and being independently investigated. “Due to a Memorandum of Understanding, the DMV cannot verify the citizenship of registered voters and is required to turn over any “suspicious” registrations to the Clark County Election Department for verification. In summary, not one elected official, investigative agency, or the Registrar at the Clark County Election Department is verifying the citizenship of voters in Nevada. What we have witnessed in the 2018 midterms is indicative of a template of fraud which consists of: Cured ballots. ‘Fixed’ Ballots. Fill-in ballots. Provisional ballots. Absentee ballots. Sample ballots. Early ballots. Late ballots. Illegal Ballots. Destroyed ballots. Found ballots. Ballots here. Ballots there. Ballots everywhere– with no evident chain of custody or process controls–which is directly reflective of an out-of-control voter registration and voting system that openly lends itself to fraud and the disenfranchisement of American *citizen voters. Unfortunately, many elected officials are not enforcing existing voter laws. For, if they did, Brenda Snipes would be sitting in a jail cell awaiting trial. Instead, she is giving interviews to CNN, thereby empowering the criminals who rob us of our more precious, fundamental right: our vote. I had never heard of you or yer blog, til you chimed in tonight on the Bill Cunningham show. I’m in recovery from journalism. My last fulltime reporting job was AP Kabul during the civil war of the early ’90s (which led to the rise of the Taliban & AQ, and to 9/11). I fell off the wagon occasionally after that, but I can claim a decade & a half clean & sober. That means I found out about Fake News – the creation of false overarching narratives that distract the public from what’s actually going on – a quarter-century before everyone else did. God gave me a brain, so I revolted. I came home, pursued a medical career & never looked back. I was too old to become an MD so I became a PA. I went into emergency medicine. It ain’t that different from political journalism: scumbags with agendas lie through their teeth to me, all day long. Keep up the good work, henceforth I’ll be paying close attention! Megan, thank you. You are spot on! As a retired 70 yr old citizen I am very concerned this mid term election was a “practice” for the Dems to see how much they can cheat the vote AND get away with it! They are prepping for 2020. I think it is time for a voter ID card, I hate to say it. Here in Oregon the vote by mail is a sham….you can open your sealed ballot to change your vote, seal it back up with tape and mail it in and they will count it. My deceased mother kept getting ballots for a year until I finally went to the voter office with her death certificate!!!! So easy to change people’s vote. From all my liberal friends, the disbelief our awful Governor Kate Brown got re-elected, was a shock. Many Dems voted Republican in this race. Exit polls didn’t match the vote. Every state needs to go back to voting in person, those who really care will vote, the many illegals I doubt will show up! Please keep up your diligent work, it is greatly appreciated. Portland, a liberal heckhole and craphole, has taken over your state. On the morning after the elections when I saw the results I was Furious! I jumped up and down and screamed they cheated they cheated! That is the only way that every single office went Democrat! We need to clean up our act and stop allowing all of this cheating to go on, voting in person would solve that. Voter ID would solve that. We can’t leave this sit, we need to do something! All of this cheating is going to disenfranchise all of us Americans who have a right to vote! Thanks for your help in cleaning up our state politics.. dave b.
I heard you on 790 AM today and would be happy to look at the data. You said you only had analyzed only 6%. Using state of the art computer software I would help you. I am a statistician. And I am an expert at analyzing large data sets. I have a PhD in Physics, an M.S. in statistics, a M.A in mathematics and a B.A. in physics. I have a Big Data Analytics certification from MIT. I an expert in R, Excel , and SAS these are statistical programming languages for handling large data sets. I would be willing to look at your data free of charge, because this problem interest me. I am full time faulty for a for profit nursing school in Las Vegas where I teach Mathematics, Statistics and Chemistry. is the RNC going to call for voter count in NV, I live in LV and went to vote at about 9:30 to 10:30 am 3 or four other people were their only one voted while i was their and two people were walking in as i was leaving. My husband went between 4 to 5 pm and he said very few people about 6 voting I believe something is very wrong. We just saw what you are talking about today at the Nevada Senate illegally passing universal background check initiative SB143.Bought and paid for Bloomberg Democratic clowns.Illegally voted in.I spoke against as did hundreds but it was a sham dog and pony show.